Question: Who was the first artist to take a Lennon & McCartney-penned song into the American singles chart some eight months before the Beatles charted their own version of and which song was it? Give up? 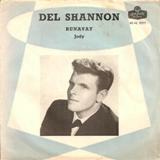 Well it was Del Shannon who covered From Me to You in a very faithful version, but it’s not that song I’m focusing on this week, but Del’s only transatlantic number one, Runaway. Del was born Charles Westover in Grand Rapids, Michigan in December 1934 and grew up listening to country and western music which prompted him to learn both the guitar and ukulele. He served in the army in Germany in 1954 where he joined a band called the Cool Flames. When he returned to the US he took a job as a carpet salesman by day and played guitar in a band called The Moonlight Ramblers at the Hi-Lo club by night. There was a keyboard player called Max Crook who auditioned for Del’s band and showcased his new gadget called a Musitron, a prototype synthesiser which could copy violins and other instruments. As soon as he heard it, Del said, “Man, you’re hired.” The music publisher, Ollie McLaughlin, was impressed with the group and asked Del and Max for original songs. Max wrote the instrumental, Mr. Lonely, the B-side of Johnny & The Hurricanes’ 1961 hit, Ja-Da. Then it came to the recording and in January 1961 Del and Max, along with their respective wives, Shirley and Joann, went to New York and the two men recorded with session musicians. The record company, Big Top, had sped up Runaway causing Del to remark, ‘That doesn’t sound like me.’ To which the record executive replied, ‘But nobody knows what you sound like, Del.’ While they were recording, Shirley and Joann joined the audience of a TV show and Joann ended up as a winning contestant on Beat The Clock. Almost nine months to the day, Shirley gave birth to their daughter, whom they named Jody, after the B-side of Runaway and itself named after a girl who went to the Hi-Lo. He once said he wrote the words to Runaway about himself because he was forever running away from relationships as the song told the story of a guy whose girl leaves him, and he is left wondering why it went wrong. He was also a modest man and never claimed he was doing anything original with his vocal, saying that it borrowed from The Ink Spots’ We Three, Jimmy Jones’ Handy Man, Bobby Darin’s Dream Lover and Dion & The Belmonts’ I Wonder Why. Runaway was a great recording debut and led to Shannon charting 13 more hits in the UK 11 of which were written or co-written by Del. The nearest he came to topping the chart again was with the 1962 hit The Swiss Maid which made number two and was written by the future chart-topping singer Roger Miller. Max’s Musitron can be heard at its note-bending best on Don’t Gild the Lily, Lily which was on the B-side of the follow-up to Runaway, Hats off to Larry. By the beginning of the 1970s, Del’s career had petered out and he turned to alcohol. In 1974 he recorded the song And the Music Plays On which was produced by Dave Edmunds. Four years later he gave up the booze and signed a deal with RSO records and began working on an album called Drop Down and Get Me which was produced by Tom Petty and recorded with the Heartbreakers, Tom’s backing band. Just prior to album’s release RSO went bust and was handed over to Network records. The album featured mainly original songs but there was a cover of the Everly Brothers’ Maybe Tomorrow and The Rolling Stones’ Out of Time. Anyone who has toured with Del Shannon knows he was full of obsessions – one day he was attacking sugar and the next day scooping down ice-cream – and he went from one fad to another. His songs reflect his paranoia because he suffered with depression. On 8th February 1990, Shannon took his own life with 22-caliber rifle. After his death the Traveling Wilburys paid tribute when they recorded a version of Runaway. The following year Jeff Lynne helped to complete Del’s final album, Rock On and Del was posthumously inducted into the Rock and Roll Hall of Fame in 1999. ← Rock ‘n’ Roll pioneer, Fats Domino dies at 89.